Thank you for considering Albemarle Baking Company for your special day. If you have heard about us from a caterer, wedding professional, or friend, it is likely that they mentioned us because of our commitment to put flavor before flair. We have built our reputation on perfecting the delicate balance of cake, filling, and icing for over 15 years and we invite you to taste what all the excitement is about. We can make just about any flavor combination you can imagine, but to help steer you in the right direction, we offer our signature “tasting cake”. This 6” cake combines all of our most requested flavors into one cake—vanilla cake, bavarian cream filling, chocolate cake, chocolate ganache filling, crunchy praline, buttercream, and marzipan. 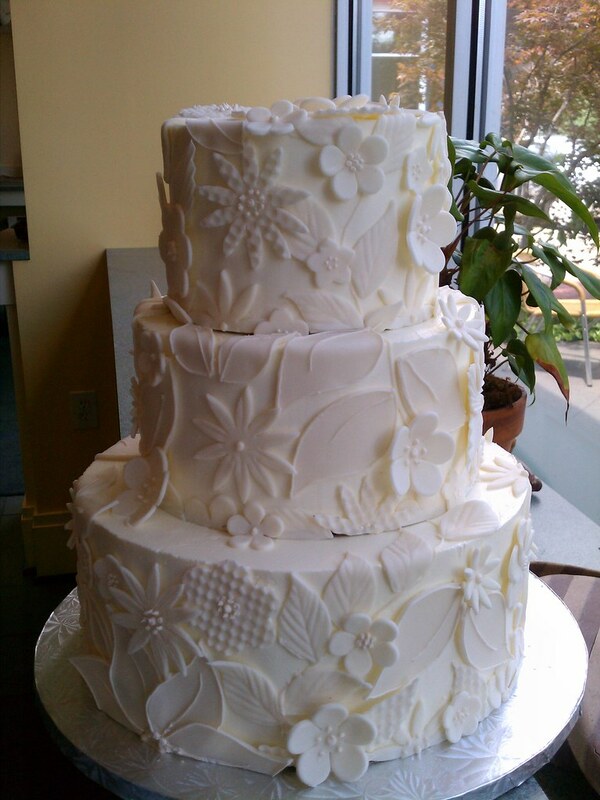 We are quite confident this cake embodies the essence of the style of baking we do at Albemarle Baking Company. Experience tells us that simpler is better, and from just these humble components, you will be able to create a wedding cake that will keep your guests talking long after the wedding is over. A custom 6” sample cake, or 6” signature tasting cake is just $25. We will gladly credit this amount to your wedding cake order (over $200), should you choose Albemarle Baking Company to create your wedding cake. If you would just like to sample a slice of cake, our bakery sells freshly prepared cake by the slice for $3.85. Our most popular cake—the Princess Cake—is composed of vanilla cake, bavarian cream filling, and marzipan icing. The Chocolate Torte—chocolate cake with whipped chocolate ganache filling and chocolate buttercream—is also sold by the slice. Cake slices that are purchased will not be applied to your wedding cake order. If you are committed to flavor as we are, then eating previously frozen wedding cake is something you probably would not consider. Out of respect for our customers, it is our opinion that a cake tasting should be no different. For this reason, we do not offer slices of previously frozen cake at our cake tastings. We encourage you to pre-order your 6” tasting cake or sample ahead of our meeting so it can be freshly prepared for you.